Each case contains (6) 6.4 oz of Freeze Dried Green Beans. 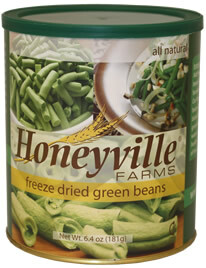 Honeyville's Freeze Dried Green Beans are produced when moisture is removed from fresh garden green beans using a very low temperature and a vacuum. Only about 3% moisture remains in the freeze dried green beans at the time of packaging. The end product weight is reduced by over 90%, while the volume stays the same. This remarkable process concentrates the fresh taste, natural color, and texture of the fresh green bean in it's freeze dried state. When re-hydrated with water, freeze dried green beans will maintain the texture and shape of fresh green beans, with no shrinking or shriveling. Each can contains about 36 1/4 cup servings of Freeze Dried Green Beans. Shelf Life: Freeze Dried Green Beans may be stored in the sealed #10 can (with included oxygen absorber packet) for 5 to 10 years under ideal storage conditions (a cool, dry place).